As foretold, Google has released a new version of its Google Maps for Mobile application for Palm OS devices today. The most anticipated new feature, the "My Location" service is only compatible with the AT&T and Verizon Cento at this time. The Sprint Centro will be made compatible via a software maintenance release expected sometime later this summer. Palm OS Treo devices are apparently not compatible with the new feature and Palm has no plans to release and update for these devices. Google's blog post states "older Palm models such as the Treos don't have the APIs needed to get the cell tower data, so My Location is not available on these models." Google Maps v2.0.20 also features some additional new features that all devices can take advantage of including hybrid view so you can view satellite imagery with street names layered on top, an improved business and address search, and a route summary that allows you to scroll through step-by-step directions. Google Maps Mobile can be freely downloaded from google.com/gmm. But Palm could make them available to Treo owners couldn't they? There's always the Palm method of selling their users patches they should make available for free. It seems Palm has been hiring and adding to their team of "Customer Shafting" professionals. I was in the Verizon store getting my first lengthy hands-on session with a Treo 755p. Though it seems bulky and I don't care for a hardware keyboard, I think I'm about to get one to see if I can go all convergence crazy. I'm sure I will tote my TX for a while though. I tried the Centro find the screen too small and the KB even more useless than the Treo, but it has those few updated programs that Treo users get screwed out of. 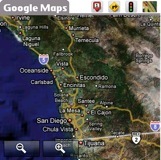 Add the lack of this nifty Google Maps functionality and you can tell Palm doesn't want to sell any more Treos. Argh! Bleepin' Palm should make their logo a stubborn mule! Were this ~6 months ago, I'd say "give it a shot". But now, after the royal shafting of 755p owners in regards to the Centro-only GMM, stuff and Palm's recent admission that Treos are gonna be all-WinMob from here on out, I think the 755p is definitely the redheaded stepchild of Palm's lineup. 1. Buy either an unlocked 680 (used) or Centro (new) if possible to go GSM and see if you can live with it. If you don't like it, you'll probably be able to sell it and recoup most of the purchase price. 2. If the above is not applicable, give a VZW Centro a whirl under their 14-day no questions asked trial period. It's got worse battery life than the 755p, non-rubberized exterior, a miserable stylus, and a tiny screen & keyboard. But it is cheaper and does qualify for the "cheap" smartphones data plan whereas the 755p does not. 3. Since you've already got a TX, my recommendation would be to either get a few accessories for your TX and settle in for another year and see what Nova brings. No Palm Inc. product, smartphone or PDA, is gonna give you the 128mb, 320x480 LCD, wi-fi, & solid stylus you have on your TX. 4. If $ permits, buy another TX like I did and stick it away "just in case" nothing else pans out. As you can see from my device history in my sig, I grudgingly went from a TX to a VZW 700p then to a VZW 755p, but only because my employer pays for most of my Verizon bill and it was imperative for me to have some kind of e-mail access while out of the office and BT DUN on a CDMA phone isn't possible on a TX. Otherwise, I'd still be carrying my TX + a dumbphone. I carry my 755p as my daily/work device but keep the TX around my house to use as a poor man's web tablet & photo viewer. I also keep its PIM data current with my Treo if I need to travel to a non-CDMA country where I can at least jump on a few wi-fi hotspots. Well, This frankly cemented a decision I have been mulling over. Us palm users have been putting up with this stuff for years now. No wifi in treos (garnet), lousy bluetooth compatibility in many cars, etc etc, and now the google maps api's. My solution? I hate Winmobile, so I am headed to a Blackberry curve. I would move to an iPhone, but I like the physical keyboard, and I have an itouch I carry in my briefcase. I got off on the wrong stop in a city back in Jan, and used google maps to find where I was. I physically put the cross streets in, and found my location. At the time, I thought "this would have been so easy with location services in google maps," and decided then and there, if palm didn't update the api's, I was done. Once I get everything moved and set up on my mac, to work with blackberry, MissingSync for blackberry, Ical, addressbook, and bento, I am switching. Too bad, I had one of the first Treo 600's, but its time to move on. Perhaps I'm missing some prior discussion here and forgive me if someone's already raised this but - what's wrong with the 3rd party app MyLocation http://tinyurl.com/26utyf ? I know it would be nice if this functionality was built in to GoogleMaps app, but I've used the MyLocation app several times when I got lost on the roads and it's worked like a charm. To the point where I probably wouldn't bother updating GoogleMaps even if this feature was included out of fear of disturbing the equilibrium. All I'm saying is, of all the things Palm hasn't done that has caused me to lose interest in the platform, this isn't the deal breaker for me! It's a little off topic, but I'm not clear on the reasoning for dumping your TX in favor of a 755p. You say that "...BT DUN on a CDMA phone isn't possible on a TX." I have a T3 and a Verizon (CDMA obviously) Motorola V710. I specifically got these two devices in order to use the BT DUN to get to the web; it works fine. A while back when they were on sale I bought a TX so that when the T3 dies (hopefully never) I'll be able to continue the practice with the TX. I understood it would work fine, but haven't tried it. Moved onto a Curve myself a month back. Thinner and more sturdy then my Treo. No antennae. Has Wifi (including VOIP) and multitasking. I look at my Treo now and it looks like some primitive stone tool which would be used by a Neanderthal. And oh yes, "My Location" works out of the box with Google Maps. Opera Mini provides a compelling browsing experience (especially over wifi), and GMail Mobile fits in like a native app. After 12 years of Palm usage, I'm done. Hey Palm, you know that middle finger you've been extending to your user base for the last 4+ years.... right back at ya. I can say the third party My Location works like a charm with the Treo 680. Great work from Razix! I hadn't heard that all future Treos will be WM, but that seals the deal for me. Palm no mas. Goodbye T W. Another one bytes the dust. I remember the guy around back during the Tungsten T days. Palm's board meetings must be akin to that "Cable Company" on the commercial where the guys says "We need new customers. All of our just call and complain and are upset all the time." Nothing a new Treo can't fix tho ... just have My Location as a downloadable update, change the color, and move the buttons around. He'll be back! Justauser, yes, you are missing one point. That application does not work on CDMA Treos, only on GSM. Hack to port the APIs to older Treo, anyone? Seems like a good opportunity for some back-porting of the Centro APIs to the older Treos. I know it probably won't happen, and is not as good as an update directly from Palm, but it's a cost/benefit equation for Palm. IMHO, I'm really surprised they didn't at least include the Treo 680 and 755p, I think that is really odd. As for for 700p??? Probably not worth it. I used to work with people close to the Windows Mobile team that customized WM ROMs for the carriers and such. That team at MS spent a TON of time and money working with the Carriers to work through their painful change control processes. This a tough decision to have to make, but at some point it just doesn't make sense for the $$$. RE: Hack to port the APIs to older Treo, anyone? C'mon Palm. Just sell the APIs or ROM update to Treo users with a no warranty clause. At least leak the proper files out to some folks around here. Allow them to sell the upgrade themselves. You won't make any money, but you'll keep more of us around until Nova arrives. Of course after that I'm not too positive. This is a pretty big slap in the face, especially for phones that are still available at outrageous prices. At least 680 & 755. I like the Centro a lot for many reasons. It is a nice tier down device almost identical to the 755 in a smaller pkg. My teenager loves his. That being said, there is no way I'm downgrading to one from my Treo. You might not want to alienate all you Palm OS power users. These (we) folks are not only loyal, but more like sycophants for sticking with you through your pathetic shenanigans since 2004. If this is a statement that all Treo (Biz class) users will be forced to WM anyway, then forget it. If you think I'm going to humiliate myself w/ Palm hardware running WM, then I'm outta here yesterday. Plenty of competent companies running WinMob to stick around for your disloyalty. Just get the APIs out for Treos. This is really stupid. You know, the ROM in the 755p is flash... does anyone have a Verizon 755p that they're willing to possibly brick, by trying to copy the Verizon Centro's ROM onto it? D'oh! Still no proxy support! Baaad move, google. Yeah right...more like an iphone if anything.. Your still using a Treo with Palm OS? I suppose you still use BetaMax, 8-Track, and ride a buggy to work. Thanks to Palm I'm back to using a Newton! What the heck is a Betamax, 8-Track, or Buggy? If a Treo with Palm OS is the equivalent of a BetaMax, 8-Track, and buggy, then what exactly is a Centro w/ Palm OS. So Palm's product strategy is pairing an outdated horse-drawn buggy with YACWMSP (yet another crappy windows mobile smart phone) aka the Ford Taurus of the smartphone industry)? Maybe Cobalt wouldn't have been so bad after all. I can not believe they released an update with no support for 320x480 why would they release an update without this basic support? Google is just following what their dealt. Palm's crap. Any postive responses to this news? Well at least its a good thing for the VZW Centro users who had to wait so long to get the device in the first place. RE: Any postive responses to this news? I would have hoped that they would have enabled bluetooth GPS support for PalmOS. I am not about to get a SSS device with an exorbitant data plan unless there was a good reason to. Hybrid mode! 'Bout time. Thanks, Google. I played with a VZW Centro at the local store tonight I took the liberty of updating GMM on the demo device and gave the clueless sales rep a quick demo. I have to admit, despite being about .8 miles away from where I actually was, the GMM location feature was quite impressive. It put me at least on the correct side of the interstate and was VERY fast. I mean, VERY VERY fast. I can imagine this being quite a useful feature of you're hoofin' it through a large, unfamiliar city and trying to at least get your general bearings. The hybrid map view makes things all the much nicer. And the smoother/faster scrolling in this new GMM for Palm is a nice touch as well. I still remain extremely underwhelmed by the Centro as an overall package, unfortunately. Doesn't work on some of their current and very recent devices? Yawn. No surprises here. This is business as usual for an unresponsive, directionless, downwardly-spiraling company. The main concern of the board is likely how to get as much compensation fron the company before it folds or the get booted. If you want it to work on a Treo contact Dmitri. Palm never ceases to amaze me at how hard they work to push away the only customers they have. The currently available and selling Treo 755 (retail $600?) won't get the APIs for this feature, and yet the $49 Centro toy has that and more? Way to go, Palm - no wonder Enterprise customers think you're a joke. Blackberry is garbage in a lot of ways, but you managed to make them superior. The WinceMob devices gave Palm a couple years of breathing room and publicity, but it's really the PalmOS that keeps people interested in the company at all - and they don't even own it... 2009, or 2010, or.... before the next OS (announced years ago) might see daylight. Windoze Treo? I don't think so - I have a desktop system for my start->programs->(program group)->program launching needs. I just want a phone with a damn good PIM and Palm app compatibility.